Revitalizing the revolutionary HyDrive design, Hartke's HyDrive HD Series Bass Cabinets are the next step in speaker evolution. 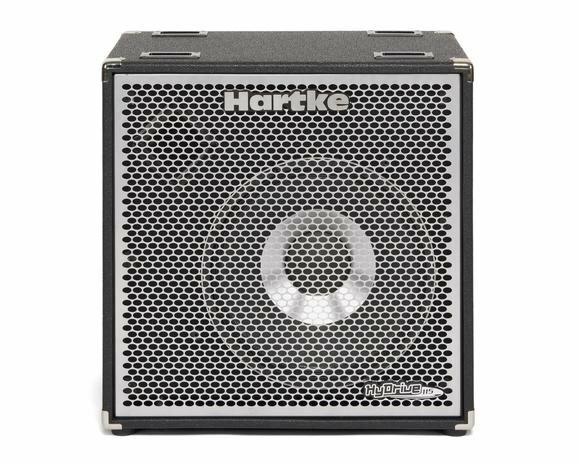 An improved version of Hartke's patented paper/aluminum HyDrive Speaker Technology delivers unmatched tone depth and clarity, while rugged, yet lightweight plywood construction and huge power handling solidifies these cabinets as the right choice for modern demanding bass players. HyDrive speakers feature carefully crafted paper/aluminum hybrid cone drivers. The hybrid makeup delivers an exceptional blend of warmth and attack that can't be attained by traditional all-paper bass speakers. The outside curved Kevlar®-loaded paper cone delivers smooth, even response with a deep tone, while the inner straight anodized aluminum cone produces highly accurate, distortion-free output.